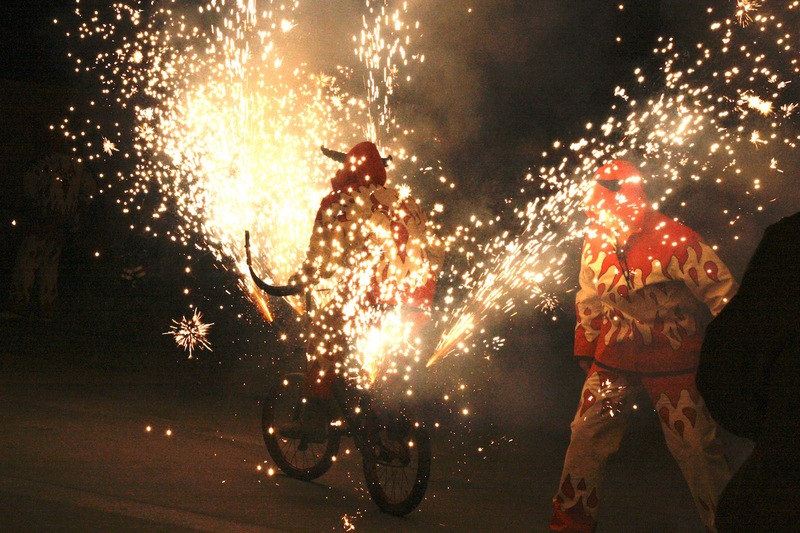 This weekend and next weekend, people in El Perelló and Rasquera will take part in correfocs – fire runs – one of the most exciting spectacles in Catalan culture. As night falls, groups of young people shroud themselves in flameproof devil costumes, then – to a heart-pumping drum beat – they dance and run (or even cycle – see picture below) through the crowds as they light fireworks. Younger children wrap themselves up in hats, scarves and gloves and run along with the devils. 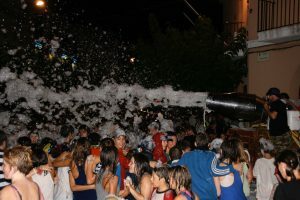 El Perelló’s Festa Jove is on Saturday 30 July includes a correfoc from 10pm, then the main square will be filled with water and foam for everyone. Rasquera’s correfoc is part of the town’s ‘festa major‘ and starts at 9.30pm on Saturday 6 August. If you are going to watch the correfocs, expect to have to run out of the way of the devils, and consider wearing a hat or scarf to protect yourself from sparks. Young children may be better at home, watching from a distance, or inside a bar.